I know, I know, I'm supposed to do a once month max project for the challenge. The reason for it is to not spend too much time producing a product that noone will want. You always want to validate as quickly as possible. However, I had my reasons. This project was a scratch my own itch thing: I've been journaling for some time and I built it with myself as a user in mind, so I know I'll have at least one user (but of course I hope you will enjoy it too!) . Also, I actually really really enjoyed learning how to code Android. The general advice for developers on IndieHackers is to get out of developer mode as quickly as possible and go into marketing, however, I really enjoy the product development aspect and hey, this is all about enjoyment at the end of the day. Now let me tell you my story. I've been listening to the Tim Ferris podcast for quite some time now and he talked about his journaling along with other guests who journal. A couple common themes were that they have common things that they think and write about each morning. Gratitude is one of them. I think this is huge. Today we live in a world where we are pushed to constantly excel and achieve and push ourselves. We look around and feel anxious that we might not be doing as well as our coworker or maybe that one guy launched his successful company at 13 but we are already approaching 30. Especially with the spread of social media, all sorts of mental ailments such as anxiety and depression have come about. The cure for this is gratitude. Shifting the focus from what we don't have to what we do. We are all pretty lucky, but we generally don't take time to consider this. how could I have made things better. Its very simple but the effects are profound. You have to take time to reflect on things or else things stay the same. Structured journaling was great because it forced me to ask myself specific things. So I journaled away for a few months. After some time I realized that I wanted to change the questions that I asked myself. I found a few other questions that I wanted to reflect on each day. The specific one was to reflect on a how I pushed or challenged my self that day. I wanted to make sure I was thinking about growth. The app that I was using didn't offer that option. Why can't I ask myself whatever I want? And that's where I got the idea to create an app that was flexible enough to handle this. 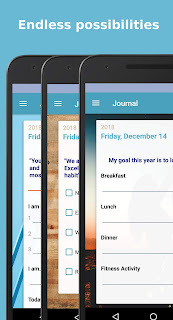 As your focus changes you can change the structure of your journal to focus on what you want. Maybe its personal relationships, maybe its fitness and exercise. Whatever it is, you can put it in your journal. Today would be great if..
what is something out of your control that you should stop worrying about? That's it. But of course I'll adapt it as I go. That's the whole point.